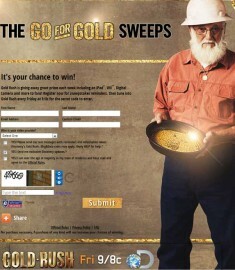 Enter the Go for Gold sweepstakes from the Discovery Channel! You could win a whole bunch of free tech stuff with the GOLD RUSH giveaway, one of the best TV shows on today. Each week the Gold Rush sweepstakes is giving away tech goodies. You can enter 1 time per week until the ends of the sweeps. Remember when the Discovery Channel was really more informative and mostly animal shows? Now the Discovery Channel is uber entertaining, jam packed with awesome shows and some serious viewership! It is your chance to strike it lucky! Gold Rush is giving away fab prizes every week including an iPad, cameras and more! You can register for sweepstakes reminders so that you don’t forget to enter every week! Watch Gold Rush every Friday 9/8c for the secret code to enter! Don’t miss out and make sure you enter before the closing date of February 2nd, 2014 at 3:00 a.m. ET. Here is a comprehensive list of the prizes available to win (in the order of winning, one per week, see official rules for breakdown), A Samsung Smart TV $649.99, A Go Pro Camcorder $329.99, An Apple iPad Mini (Wi-Fi 16GB) $329.99, A Samsung 2.1 Channel Soundbar $349.99, An Amazon Kindle Fire HDX 7 inch tablet with 16GB memory $229.99, A Wii U Console $299.99, A pair of Beats by Dr. Dre Beats Studio Over-the-ear headphones $299.99, An Apple iPad Mini (Wi-Fi 16GB) $329.99, A Canon EOS Rebel T3i Digital SLR Camera $499.99, An Amazon Kindle Fire HDX 7 inch tablet with 16GB memory $229.99, A pair of Beats by Dr. Dre Beats Studio over-the-ear headphones $299.99, A Wii U Console $299.99, A Canon EOS Rebel T3i Digital SLR Camera $499.99. I’m loving some great tech giveaways at the moment! Have you ever seen the addictive show Gold Rush on discovery? I have to admit I was skeptical, but after some persuasion from husband I have to admit I am hooked! Enter the Gold for Gold Sweepstakes this Friday! *UPDATE: 1/10/14 CODE is #The Veteran – Win a Free Amazon Kindle Fire! *UPDATE 1/25/14 CODE is #KEEP MINING – Win a Wii U for Free! *UPDATE 1/31/14 CODE is #Go Big or Go Home – Win a Canon® EOS Rebel T3i Digital SLR Camera! I LOVE WATCHING GOLDRUSH,WISH I COLD SEARCH FOR GOLD! !